Are gifted children God given or something parents can nurture? I don't have the answers, but I am happy to share an upcoming parenting seminar by Pamela Lim. In a frank and insightful session, she will help parents discover the importance of raising their child to be gifted. I don't think there's much of a tiger parenting in here, but that every child has a potential that can be accelerated to perform better than the norm. An event for parents who want to raise happy and gifted children with practical and useful tips and strategies for real change. Pamela is a very well-known gifted educator, who was also an award winning entrepreneur and CEO. Through her strategies, she managed to put four of her five children into universities before they reached 14, and in four different disciplines. Her fourth child won a place at one of the world's top varsities at 12 while her youngest was taking pre-university courses at the age of 10. Her journey poses many challenges with her children variously diagnosed with autism, executive function disorder and existential depression. One was even suspended from school for almost two years for misbehaviour. She believes in giving children maximum free time and minimal stress. From seven to twelve years old, her task was to discover their passion and start to look for programs that feed that passion. This is important to a parent because the earlier a child understands himself or herself, the easier it is for the parent to guide the child. This half day session could change the course of your child’s lifetime. I have no insight to what we'll be expecting, but with an open mind we are pretty excited to sit in for a session. After all, parenting is all about learning and sharing experiences. This session is suited for parents with primary school going children who are aged 7 and above. Parents of children aged 7 months to 6 can sign up here for a different session on Is My Toddler Gifted? Readers of Mum's calling are able to sign up these sessions or any event activities at the upcoming Learn through play educational festival, at a 30% discount Quote "MUMSCALLING30" upon checkout. To attend these seminars FREE, simply quote "PAMELA" upon checkout. Be quick, as there are limited free places. If not, you may purchase tickets here (with above 30% discount code). Any proceeds from tickets purchased will be donated to a Cambodian school for their secondary school building fund. Pamela is not remunerated for these sessions, except for a free booth to showcase her patents that you can visit at the festival. If you did not score your seat with the above code. Give a lucky try at our giveaway! 2. Tag a friend on this Facebook post, whom you think will be keen in this session. Giveaway closes on 08 Aug 2016. Good luck! Disclaimer: Sponsored post. No monetary compensation involved. Our firstborn was birthed 7 years ago, followed by our second born 5 years ago and this year, our third! In all my years of baby caring, the popular sterilizers then were commonly the electric steam ones. In the recent years, UV sterilizers have sprouted and I never knew how it worked, till now. Sterilizing is an essential step in baby feeding, whether we bottle feed, latch or express milk, we will need a sterilizer somehow. It's one crucial step to protect a baby against germs and infection. Heap Thanks to The little ones in my life for sending us the Haenim 3rd gen UV sterilizer. We had the opportunity to explore, use and now we can share our experience on a UV sterilizer. It uses pulses of Ultraviolet (UV) light that are powerful to kill up to 99.9% of microorganisms such as germs, bacteria and viruses. So there's no high heat or steam in the process. UV sterilization is commonly used in the medical field and water purification to ensure the highest level of disinfection. Think NEW water and water that comes into our home. The best part about it, is that we don't have to deal with wet bottles or pumps parts anymore. It's not just a sterilizer, it's a dryer too! No need to load water into the sterilizer. It works as with a dual function of sterilizing and drying. Just so we need not worry about mould and bacteria growing in a moist environment. All you had need to do after washing, is to shake off excess water and put them standing upright in the sterilizer, with the bottles opening faced upwards. Shaking off excess water helps get the drying done in the quicker cycle mode. We know not everything is high heat resistant, and there is an automatic temperature sensor that stops the heater once it exceeds more than 45 degrees Celsius. We love the huge variety of stuff we can choose to sterilizer in there. Toys, toothbrush, utensils or any household items, as long as it gets in there. And yes, we tried it with soft toys! You won't believe that you can get your phone in there for a good clean too. So next time your phone decides to take a swim, you can try to quickly save it with the drying mode. 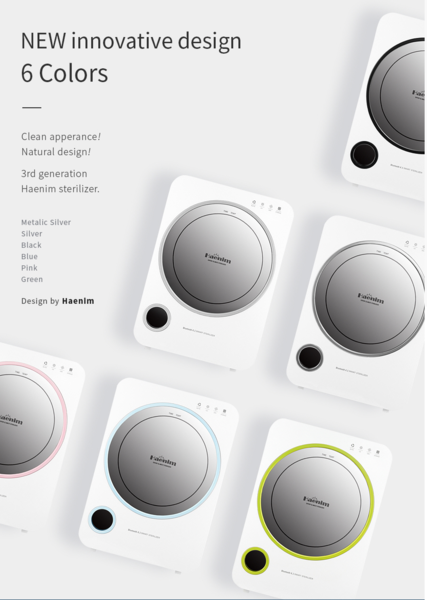 There are only 4 operating touch buttons - Auto, sterilize, dry and storage functions. I set auto 1 with about 4 bottles and a single pump parts, it worked with 20 minutes of drying and 5 minutes of UV. Total ventilation time is 30 minutes. At the end of it, I had completely dried and sterilized bottles. If you have a larger quantity of items to dry and sterilize, you can go for auto 2 or 3. If you've got dry bottles and only need sterilizing. You may choose a 5 or 10 minutes sterilizing option. In fact, if you are in a rush and don't mind slightly wet bottles or items, you can use the UV function without drying. The UV-ed water droplets is safe for consumption. If you have a full load in the sterilizer, go for the 10 minutes cycle. If you just need the dry option without sterilizing, you may go for any of the 3 dry options. Which are also dependent the quantity of items you are drying. This function allows you to auto sterilize the bottles every 2 hours for 8 hours to ensure that the bottles and pump parts are ready for use anytime. In sum, the shortest time to sterilize and dry bottles is 30 minutes, which is relatively longer than a steam sterilizer. But I'm looking it this way, while only one bottle is in use, the rest will be kept dry in the sterilizer. I wouldn't need the dry function, and I can get sterilized bottles with only the UV function within 5 minutes. It now matches up to an electric sterilizer. And I'm sure most of us would have more than 1 bottle for use. These touch buttons are extremely sensitive. I was once operating the auto function, and itchy handed kids came to curiously see how it worked, their little fingers accidentally touched the button and it reset. It's highly sensitive. There is also a timer and temperature display on the door that I can conveniently glance whenever I walk past it. As temperature within is controlled to not exceed 45 degree Celsius, everything is only warm to touch at the end of the process. You won't need the tongs or jumping fingers to access the items. Operation in blue indicates that UV mode is on. Operation in red indicates drying. It did feel like I was working with an oven, but there isn't any extreme heat. A huge capacity with 2 removable metal tray racks at fixed level. The upper level will fit tall bottles and about 16 regular milk bottles. The tray's gap may be too wide for any small parts, but I'm glad the small parts of my breast pump sat well. The bottom tray can be pulled out to conveniently place or reach the items behind. Descaling a steam sterilizer is almost a bi-weekly affair for us. The UV sterilizer is often warm and dry, so maintenance is really low. All you had need to do is to use a slight damp cloth to wipe the trays and interior. It's early to say, but I'm not sure if the metal trays are exactly rust resistance. Since wet stuff gets to sit on it, it would be good to wipe and keep dry all times. We do need to replace the UV Osram lamp annually. I guess that's the only yearly cost involved. These special medical grade lamps are available for purchase online at The little ones in my life. The 3 components - Dry heater fan, ventilation fan and fine dust filter work in perfect synergy. The heat fan and ventilation work at the same time, so the drying power is strong and effective in removing any smell. It uses PTC (Positive Temperature Coefficient) heater which is excellent in thermal efficiency and moisture condition. It is not only safe and long lasting, its noise level is almost negligent while drying. Electricity consumption is very much saved with it as well. A wireless technology for exchanging data over short distances from our mobile. Simply download the apps and you'll be able to operate the sterilizer from your couch or any short distance. One feature not embedded in the older version. High powered UV light is damaging to the human's skin. Safety concerns are essential. Not only is UV light unable to pass through the door, it also switches off automatically if the door opened while operating. The glass on the door is secured inside plastic panels, and I love how conveniently it works as a mirror for the vanity in me. Dual UV lamp gives a good coverage of all item parts in the sterilizer, ensuring every corner is taken care of. The SUS304 mirror helps maximize the reflection of lights. It is therefore more appropriate to not stack items on top of each other. We love how sleek looking the sterilizer is and that it comes in 6 lovely colours - Metalic silver, silver, black, blue, green and pink. It definitely makes a nice 'furniture' piece on any kitchen top. We chose a black design to blend it better with our kitchen. It comes with a 1 year local warranty and that gives us some good assurance on the product. Overall, It really is an easy and innovative product to use. Stands and blends well to any kitchen top. Since we can use it for storage, items are unlikely to collect dust and the kitchen gets less cluttered without bottles and pump parts sitting around. I specially love that I can use these baby gadgets dry without any water droplets or vapour. The only downside we've encountered is a slight smell after operating and that it lingered on the bottles and pump parts for a while. It wasn't a bothering issue though. Still, a great buy! The 3rd gen Haenim sterilizer is retailing $399 at The little ones in my life (exclusive distributor) Readers of Mum's calling, are entitled at a $70 discount with the following discount code: mumscalling upon checkout. Free delivery for orders above $100. Promo code is valid only till 30 August 2016 and is not valid at fairs or showrooms. You may have to do a little homework to check if this deal is comparable to its offer at the upcoming baby fair. Nonetheless, do share this review and discount deal with your friends with are keen in purchasing a UV sterilizer. Disclaimer: We were given this UV sterilizer for the purpose of this review. All opinions and photos, unless otherwise credited are solely ours. If you are a fan of baby wrapping or sling, you should not miss the opportunity of exploring the Baby k'tan baby carrier. It's a wrap without all the wrapping! I am one Mama who dreads exploring or using complicated products. Though I was a little apprehensive to try the baby k'tan carrier, I'm glad to have hopped on the wagon. It wasn't as messy as I thought. There's no magic to using it, but it does take some getting used to it, if you are totally new to wrap. It helps when you go through the motion in advance before getting a well-fed and happy baby in for practice. After which, it's all easy with the subsequent use. Happy Coast Kids sent us the Baby K'tan Print, which is made of 100% natural cotton partnered with beautiful vibrant prints, Dandelion. Though material with the active and breeze range may be more appropriate for our outdoor weather, I didn't find this overly warm. It's amazing how I'm starting to fall in love with wrapping again! 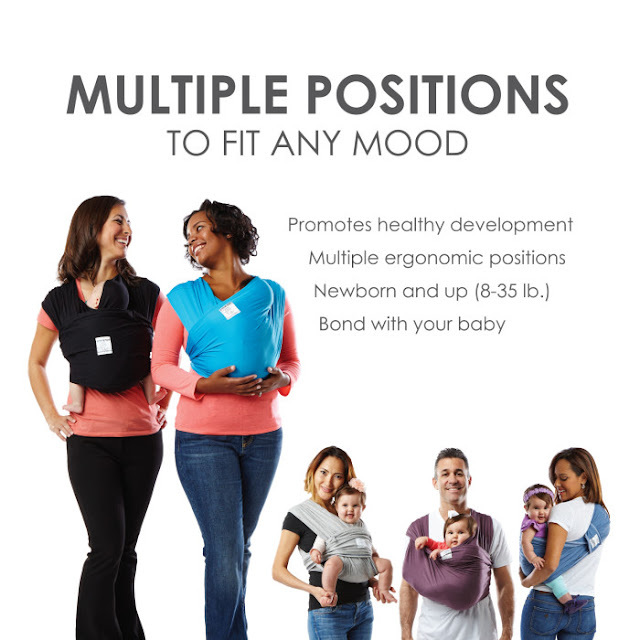 There are 6 ergonomic positions to wear the carrier. The Kangaroo, hug, explore adventure, hip and two-hip positions. Juboy is nearing 3 months, and so, we have only explored the kangaroo and hug positions. More frequently with the hug position. These multiple positions are good from newborn to toddler, up to 15kg. So if your baby doesn't like one position, it's versatile enough to try the other positions. Love it that it doesn't over work my shoulders and back. Double-loop design and adjustable back support band distributes the baby's weight across the shoulders and back, providing support for the shoulders and back. The fabric of each loop can be spread over the shoulders to further distribute the baby's weight. After which you may continue with the various positions, except for the hip positions. The carrier is made of breathable 100% natural cotton fabric, which is strong, durable and comfortable to touch. It's free from harmful chemicals, formaldehydes, and azo dyes, which makes it assuring to use in contact with our baby's skin. This unique one-way stretch and soft fabric gives both the baby and me a wonderful cozy hold. There is no hard snap or buckles on it, hence there's no worry of baby's face or skin pressing against any hard parts. It is machine washable and dryer safe. Thinking of all the puking and salivating, it's probably the best deal. It is easy to store without any unflattening bulky fabric and is easy to bring along everywhere. The carrier comes with a sash which converts to a handy storage tote and it all fit easily into my diaper bag. It was voted the most space saving carrier in 2016! The carrier comes in various sizes to customize to the wearer - XS, S, M and L. The downside of it is that, it may not be used interchangeably with the man since we are of different frames. But I'm happy to carry this close bond with Juboy. If you are in between sizes, go for the smaller of the two. I am using XS, and it fits perfect. It might shrink after a few washes but it's still of good fit. For getting a carrier in a fix individual size, it helps assure that it is correctly adjusted to the right length and distance. Taking into account the importance of ensuring that baby's face is always visible and kissable at the head. Baby should be high on wearer's body for a clear source of air, and should be supported if unable to control his head yet. Overall, the carrier is cleverly designed with an easy learning curve. I had a ring sling during Jazz's time, and I've to admit it gave me a hard time figuring out its usage by dealing with those excess cloth and positioning. Once figured out, I realised it concentrated the baby's weight load on one shoulder, which gave me a bad shoulder ache. The Baby K'tan carrier has bagged many awards and won the hearts of many Mummies. It awed me with how easy and comfortably Juboy can sit and sleep in it. He does get some quality naps in there. It feels really close and well snugged for the both of us and you won't believe that I use it in the home during his cranky moments too. Just so I can free up my hands to blog. Ha! Also, there isn't any thick waist belt, so sitting down to eat or work with the baby in, is a huge bonus. 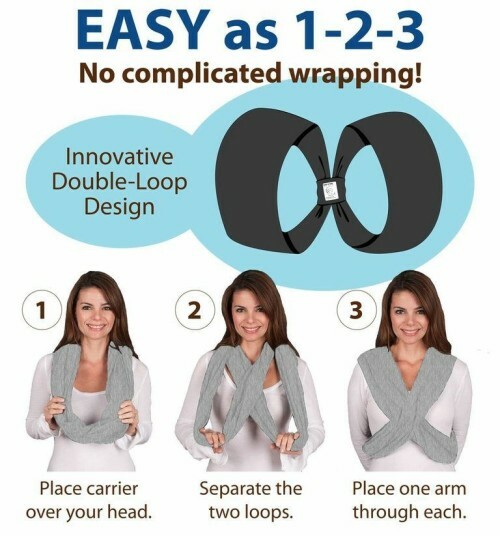 It really is an innovative blend of a sling, wrap and carrier all in one. Baby wrapping just got so much easier! 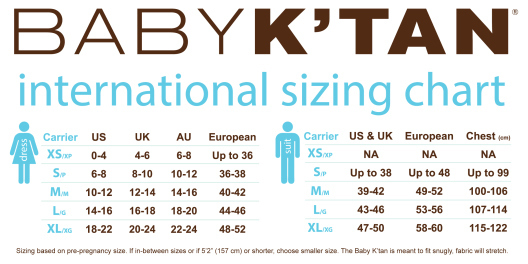 Baby K'tan carrier's price ranges from $89.90 to $99.80. Happy coast kids is the sole distributor of Baby K'tan. Happy Shopping! Disclaimer: We were given a Baby K'tan carrier for the purpose of this review. All opinions and photos, unless otherwise credited are Solely ours. I am generally a bag lover. But my collection got lesser and limited after becoming a Mum, and now a stay home Mum, I don't even need work bags. I match my outfits mostly with diaper bags! Yes, that's how a baby changes the fashion sense in me. I am happy to get hold of and review the Baby K'tan (pronounced ker-tahn) SmartGear diaper bag. And I think it's making me chic for its well-thought design and functionality. It has 12 storage compartments. Yes, we are talking about a diaper bag. Compartmentalizing is highly essential. Being well organize on the go helps me feel confident in bringing the baby out. This is one important feature in any diaper bag. It throws out any fanatic rummaging through the bag for items. This compartment is where I hold the items that are likely to wet or stain the bag. And if that happens, we know bacteria is likely to breed in any ordinary bags. The bag comes smartly with a built in antibacterial nylon lining wetbag which helps to stay germs and fungus free. It's water resistant, odour proof and FDA food safe. I would toss any soiled or dirty clothes in there too. It's now safe to say, "I forgot to bring a plastic bag!" The main compartment and built in wetbag is zipped, other than that, the pockets in and out are not zipped. The big pocket out is with a magnetic clip. These make it really convenient to retrieve my stuffs without handling a zip, which often requires both hands free. The two inner pockets are also of antibacterial, FDA food safe nylon, water resistant, odour and germ resistant lining. My fruits will get their space in there. 100% cotton exterior. BPA-Free, PVC-Free, polyurethane laminate waterproof interior nylon lining. Being 100% cotton as a bag does remind me to be extra careful about staining or wetting it, especially when I've chosen the Dandelion design which is mostly white. Being cotton also means we can work the bag to its maximum stretch. And, Yay! We can machine wash cold. Great for lazy mamas like me. I will use it on an extra gentle mode and line dry. The shoulder strap is soft and lightly padded to make carrying comfortable. It's very well thought for the carrier. It can be a tad slippery though. The adjustable shoulder strap gives me the added choice of slinging over my shoulder or across my body. There are stroller bar straps that allows you to hang it on the stroller bar. Though the construction of the bag is light, do be careful of tipping the stroller, especially if the bag heavy. It's conveniently light and will definitely be a great travel companion. After having it pumped up with diapers, clothing and many other essentials, it didn't feel overly heavy. It comes in 3 colours. Grey Chervrons, Black and Dandeloin, which is the one I'm carrying. Casual and stylish I've to say. It really has got it all covered as a diaper bag, a perfect germ resistant diaper bag for Mum's daily needs. It's gonna last me a long way with it, when I've more things to bring on the go with Juboy. The day he starts teething, weaning and potty training. And I really need not worry about space. The diaper bag is of a good size for every growing stage. A stylish, simple and smart solution to be on the go! Baby K'tan SmartGear diaper bag is available online at Happy coast kids, the sole distributor for K'tan. Priced at $99.80, I think it's good worth for its features and functions. Stay tune too, for our upcoming review on the K'tan carrier. Disclaimer: We were given this stylish diaper bag for review. All opinions and photos are solely ours.